☆ Why do people have religious beliefs ? I'd like to talk about why people have religious beliefs or why people pay a visit to god.When I ask this question,I expect answers such as for better health,for better business or for passing the entrance examination.If I asked the same question to the people from the old days,the answer would be so that the family can live in Ansin (peace or security).Ansin or Anjin pronounced in Buddhism, was the main purpose of the religious belief in the old times. People didn't pray to god because they want something or because they want to be somebody. Instead, they prayed to be able to live in peace at their hearts. When you are young, you are healthy and feel like you can do anything. That's the beauty of youth. As you get older, however, you start to feel the limitation as a person. Gradually, you learn from experience that there are things one person can not change or achieve. If so, you can do nothing but pray to god quietly after you make all the possible efforts. People who believe in Buddhism pray to Buddha, Christians pray to Christ and Muslims pray to Allah. You just have to leave the matter in the hand of god. Then, you feel Ansin and that's what a religious belief is all about. No matter how much you think about tomorrow, you can't know about tomorrow until tomorrow comes. You have to do today what you can do today. The important thing in life is to live and enjoy every moment and make today better than yesterday. Buddhism teaches us 3 fundamental principles of life. One is Shojyo (purity). People should live with a purified mind avoiding wrongdoings. Five precepts and ten precepts of Buddhism were made as the guidance. Next is Jihi (mercy). Jihi is often taken as one word but actually made up by 2 different meanings. Ji means Yoraku or giving other people joy or pleasure. Hi is Bakku or taking away sadness or suffering from others. Jihi is a big love that brings happiness to not only oneself but the people around and live happily together. You can learn about Jihi in Hokke scripture and Kannon scripture. The third is Chie (wisdom). Chie is very important in Shojyo and Jihi. For example, just treating children in a kind manner can't be regarded as Jihi. True Jihi is found in the mind to discipline children and show them what is good and what is bad. Sometimes I hear about public servants' wining and dining. Some get questioned and some have sleepless nights worrying about getting caught. Wrongdoings are bad enough itself and moreover, it brings sufferings into your life. Chie, therefore, is essential for a happy life. I believe living each day with a religious belief in the purified and peaceful state of mind is how we all are supposed to lead our lives. ☆ Do you know Tetsugen? I went to Kyoto the other day. There is a place called Obakusan-Manpuku temple in Uji and near the temple, the Hozo-in which preserves the printing blocks of the famous "Tetsugen edition of Issai sutra." It's still used to print the compilation of prajna sutra with traditional techniques. In the early Edo period, Doko Tetsugen whose name you can find in old textbooks felt ashamed that there wasn't a "Daizo sutra" or "Issai sutra,"—the compilation of all the Buddhist Scriptures—in Japan and determined to publish it himself. Printing methods were very primitive in those days. You had to carve the printing blocks one by one by hand. Then, you printed on paper piece by piece also by hand. It required a lot of money as well as a tremendous amount of time. After asking for donations door to door all over Japan on foot for years, Tetsugen managed to collect enough money for the publication. Then a big flood hit Osaka. To help the people suffering from the disaster, Tetsugen used up the funds. Soon, Tetsugen resumed his mission. When he was about to finish his rather painful task, the Uji area was struck by a severely poor harvest. Again, Tetsugen offered all the money he had collected to save people from the famine. He tried for the third time. This time he could finally begin the prolonged project with his collected money. After 20 years of effort, he completed printing the "Daizo sutra" of 6771 volumes. 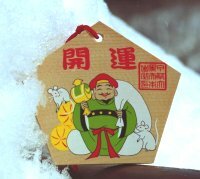 This story shows us the nobility of Tetsugen. Helping people in great need was exactly the same kind of merciful deed as devoting himself to the spreading of the "Daizo sutra." He not only knew the true meaning of the teachings of Buddha but also acted it out. It's truly amazing that the printing blocks of "Daizo sutra" made by a monk in the early Edo period with such old printing methods remain and is of great use to this day. ☆ What is the essence of Buddha's teaching? A long time ago,in ancient China's Tang period, Haku-Raku-Ten, a famous poet, asked Dorin, a priest usually sitting in Zen meditation, what the essence of Buddha's teaching is. He said "Don't act badly and do good." Haku-Raku-Ten was surprised that Dorin's messeage was so simple, that not only adults but little children could understand it as well. Dorin did say that little children knew this teaching, but the old man couldn't act on this teaching. After this Haku- Raku-Ten became a believer in Dorin. In the Japanese Middle Ages during the Muromachi period, the Load of the Japanese realm, Shogun, asked the famous priest Ikkyuu, what the teaching of Buddha was. He then answered as Haku-Raku- Ten did before. The above shows us the essence of the buddha's teaching. In short,Buddha's teaching is so huge and is so systematic, yet it is important to apply and act on his teachings rather than merely contemplating them. As a human expression of emotion, we often use the phrase "Kidoairaku" show one's feeling or do not betray one's feelings. To have a smile like Daikoku Sama and in order for one to enjoy life, the feeling of happiness is particularly important. However, I think that this Joy or happiness decreases as one gets on in years (grows old). When we are young even though we're somewhat in a stateof being alternately happy and miserable, why is it now that we meekly become unhappy. While holding one's own feeling of happiness down thinking,Anything so trivial as that one can't be happy with everything, before onerealizes it they've become a human that can't be happy. Also, if there's no one with you to make you happy, then that make's it all the more difficult (to be happy). Nowadays, it's important that no matter how small a thing it may be, one should be honest with himself/herself and find something that makes them happy. If a number of small Joys or things that makes one happy accumulate(pile up), then they will become a big Joy" or rather make one very happy. ☆ Don't worry even when you have troubles. If a problem is within your ability to solve, then you should do all you can to solve it. But there is no use worring about a problem you cannot solve. There was a man who could not sleep at night for worring about his problem. This man was worried that he could not pay back an over due debt to his friend. He worried long and hard about his problem. Then his wife said: "You are foolish. As you cannot pay the money back even if you make an effot, It is your friend who should worry. He is the one who should have no sleep, worrying that he may never get his money back." The husband listened to the story, believed his wife and from then on slept tight. Now of course this story is a joke. It is a problem that the man does not pay the money back. But it shows that if we change our point of view, we can see our troubles as being no cause for concern. Buddha said that we should not regret the past, not yearn for the future, not put off till tomorrow what we can do today. We should spend or lives as precious as we can, and only then can we be healthy. We should live is the present time, living life to the best of our ability. ☆ I've heard that Daikoku Sama is the God of the Kitchen. There's a supporting story that has been handed down that the Daikoku-Sama was enshrined near the pillars of the kitchens in Temples in India. "There was a temple where about 100 priests would be doing ascetic exercises. One day when it became time to eat dinner, due to the fast thatsuddenly 500 priests visited, they were troubled as there was no spare time to prepare another meal. Thereupon they prayed to Daikokuten and if they set the table that was a meal intended for 100 people for 500 people,it was said that they still had enough food to go around." When one comes to think about it, an account of a similar miracle appearsin the teachings of the Christian religion. That was when Christ cut one loaf of bread, cut it into a thousand pieces, gave them to his Disciples making them all full. Perhaps when one of these stories is told to me. I think it must be the verse "Man cannot live on bread alone" (New Testament, Matthew, Gospel 4:4)It is said that when one makes things rich, it makes the heart rich, and satisfying people is not only a matter of a lot or a little. There's an old phrase that says, "The Dazzling Poor". I think that no matter how muchone is materially blessed, if his/her heart is poor then he/she is unhappy.